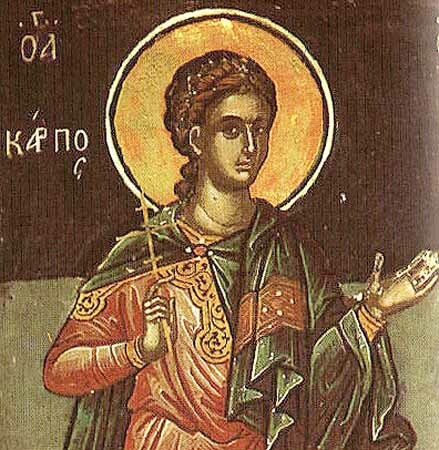 The Holy Disciple Carpus (from the 70) – was a disciple and companion of the holy Apostle Paul. In the 2nd Epistle to Timothy, the apostle mentions the name Carpus, at the house of whom in Troias he left a phelon and books (2 Tim. 4: 13). Knowing Carpus as a man of virtue and possessing a mind of lofty purity, the Apostle Paul made him bishop of Thracian Bereia. The disciple Carpus went preaching the Gospel to the island of Crete. Here he encountered Saint Dionysios the Areopagite (Comm. 3 October). In his reminiscences Dionysios recounts about a miraculous vision to the disciple Carpus. The holy disciple Carpus died peacefully at Bereia (according to other histories he received a martyr's end during the persecution under the emperor Nero).